PITTSBURGH--(BUSINESS WIRE)-- Equitrans Midstream Corporation (NYSE: ETRN) and EQM Midstream Partners, LP (NYSE: EQM) today announced that EQM has entered into a definitive agreement with a fund managed by Morgan Stanley Infrastructure Partners to acquire a 60% interest in Eureka Midstream Holdings, LLC (Eureka Midstream) and a 100% interest in Hornet Midstream Holdings, LLC (Hornet Midstream) for total consideration of $1,030 million, comprised of approximately $860 million in cash and approximately $170 million of assumed pro-rata debt. The proposed acquisition is expected to close on or about April 15, 2019, subject to customary regulatory and other closing conditions. Combined, the gathering system assets and complementary water services opportunities are expected to generate approximately $100 million of EQM EBITDA during the first twelve months. EQM forecasts that the acquired assets and corresponding water services will achieve greater than 20% annual EBITDA growth over the next several years. The transaction is expected to be neutral to EQM distributable cash flow over the first 12-months and accretive thereafter. EQM will fund the acquisition with cash proceeds from the issuance of $1,100 million of newly issued Series A Convertible Preferred Units (Convertible Preferred Units). The financing is consistent with EQM’s leverage targets, and the Convertible Preferred Units issuance is expected to close simultaneously with the proposed acquisition close. EQM has entered into an agreement to sell the Convertible Preferred Units to lead investors consisting of funds managed by BlackRock, GSO Capital Partners, and Magnetar Capital; and to supporting investors The Carlyle Group and Foundation Infrastructure Partners in connection with Neuberger Berman Private Credit. The Convertible Preferred Units will receive quarterly cash distributions based on an 8.5% annual coupon. Two years after issuance, the Convertible Preferred Units will be convertible by the holders on a one-for-one basis into EQM Common Units and convertible by EQM, under certain circumstances. The Convertible Preferred Units will be priced at $48.77 per unit, a 20.0% premium to the 20-day volume weighted average price of the EQM Common Units, prior to agreement signing. Citi and Guggenheim Securities, LLC are acting as financial advisors and Latham & Watkins is acting as legal advisor to ETRN and EQM. Citi and Guggenheim Securities, LLC are also acting as joint placement agents for the Convertible Preferred Units issuance. ETRN and EQM will host a conference call today, March 14, 2019, at 10:00 AM (ET) with security analysts to discuss the proposed acquisition. A live webcast will be available on the internet via the Investors pages at www.equitransmidstream.com and www.eqm-midstreampartners.com. Security analysts may access the call: U.S. tollfree at (877) 790-5829; and internationally at (647) 689-5636. The conference ID is 6890519. 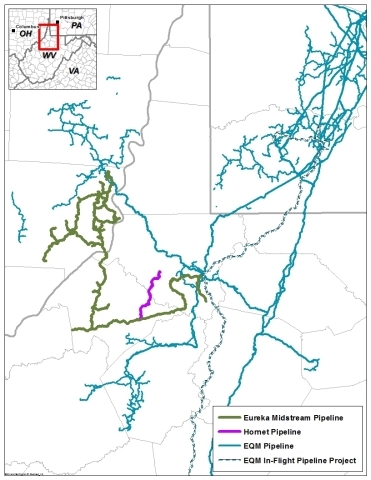 A presentation highlighting the proposed acquisition is available online via the companies’ respective Investors pages at www.equitransmidstream.com and www.eqm-midstreampartners.com. As used in this news release, EBITDA means net income before interest expense, income tax expense, depreciation and amortization of the Eureka Midstream Holdings, LLC and Hornet Midstream Holdings, LLC midstream assets (Target Assets). As used in this news release, distributable cash flow means EQM adjusted EBITDA (defined as net (loss) income attributable to EQM plus net interest expense, depreciation, amortization of intangible assets; impairment of goodwill; income tax expense; payments on EQM's preferred interest in EQT Energy Supply, LLC (Preferred Interest); non-cash, long-term compensation expense and transaction costs less equity income; AFUDC-equity; pre-acquisition capital lease payments for Allegheny Valley Connector, LLC; and adjusted EBITDA of assets prior to acquisition) less net interest expense, excluding interest income on Preferred Interest; capitalized interest and AFUDC-debt; and ongoing maintenance capital expenditures net of reimbursements. Distributable cash flow should not be viewed as indicative of the actual amount of cash that EQM has available for distributions from operating surplus or that EQM plans to distribute. EBITDA of the Target Assets and distributable cash flow are non-GAAP supplemental financial measures that management and external users of ETRN’s and EQM’s consolidated financial statements, such as industry analysts, investors, lenders and rating agencies, use to assess, in the case of EBITDA, the potential contribution of the Target Assets to ETRN’s and EQM’s future operating performance and cash flows and, in the case of distributable cash flow, EQM’s operating performance as compared to other publicly traded partnerships in the midstream energy industry without regard to historical cost basis; the ability of EQM’s assets to generate sufficient cash flow to make distributions to EQM unitholders; EQM’s ability to incur and service debt and fund capital expenditures; the viability of acquisitions and other capital expenditure projects; and the returns on investment of various investment opportunities. ETRN and EQM believe that the projected EBITDA of the Target Assets and distributable cash flow provide useful information to investors in assessing the impact of the potential acquisition on ETRN’s and EQM’s future results of operations. EBITDA and distributable cash flow should not be considered as alternatives to net income, operating income, net cash provided by operating activities, or any other measure of financial performance or liquidity presented in accordance with GAAP. EBITDA and distributable cash flow have important limitations as analytical tools because they exclude some, but not all, items that affect net income and net cash provided by operating activities, respectively. Additionally, because EBITDA and distributable cash flow may be defined differently by other companies in ETRN’s and EQM’s industry, the definition of EBITDA and distributable cash flow may not be comparable to similarly titled measures of other companies, thereby diminishing the utility of the measures. ETRN and EQM have not provided projected net income from the Target Assets, the most comparable financial measure calculated in accordance with GAAP, or a reconciliation of projected EBITDA to projected net income of the Target Assets. ETRN and EQM do not control the Target Assets or prepare the related financial statements. ETRN and EQM are unable to provide projected net income of the Target Assets or a reconciliation of the projected EBITDA of the Target Assets to projected net income from those assets because the calculation of projected EBITDA was based on projected volume growth and rate information combined with high-level, cash operating cost assumptions related to the Target Assets. As such, ETRN and EQM do not have sufficient information to project net income from the Target Assets, such as the book value of the assets, the depreciable lives of the assets and any interest incurred in respect of the assets, nor does ETRN or EQM have sufficient information regarding all of the reconciling items that may exist between projected EBITDA and projected net income for the Target Assets. Therefore, projected net income of the Target Assets and a reconciliation of projected EBITDA of the assets to projected net income from those assets are not available without unreasonable effort. The Convertible Preferred Units to be sold in the private placement have not been registered under the Securities Act of 1933, as amended (Securities Act), or applicable state securities laws, and accordingly may not be offered or sold in the United States except pursuant to an effective registration statement or an applicable exemption from the registration requirements of the Securities Act and such applicable state securities laws. This news release does not constitute an offer to sell or the solicitation of an offer to buy these securities, nor shall there be any sale of these securities in any state or jurisdiction in which the offer, solicitation or sale of these securities would be unlawful prior to registration or qualification under the securities laws of any such state or jurisdiction. Disclosures in this news release contain certain forward-looking statements within the meaning of Section 21E of the Securities Exchange Act of 1934, as amended, and Section 27A of the Securities Act. Statements that do not relate strictly to historical or current facts are forward-looking. Without limiting the generality of the foregoing, forward-looking statements contained in this news release specifically include the expectations of plans, strategies, objectives and growth and anticipated financial and operational performance of Equitrans Midstream Corporation (ETRN) and its subsidiaries, including EQM Midstream Partners, LP (EQM), including guidance regarding EQM’s gathering and water services revenue and volume growth; projected revenue and expenses; infrastructure programs (including the timing, cost, capacity, and sources of funding with respect to gathering and water projects); the cost, capacity, timing of regulatory approvals, and anticipated in-service dates of current projects; EQM’s ability to provide produced water handling services and realize expansion and optimization opportunities; acquisitions and other strategic transactions, including the proposed acquisition of interests in Eureka Midstream Holdings, LLC (Eureka) and Hornet Midstream Holdings, LLC (Hornet), and EQM’s ability to complete the proposed acquisition, effectively integrate the proposed acquisition and achieve anticipated synergies and accretion associated with the proposed acquisition, including, through increased scale, EQM’s ability to access new customers for its water services business associated with the proposed acquisition; the expected timing of the closing of the proposed transaction and related financing (including amounts); the expected accretion from the proposed transaction; the expected ratings impact, if any, associated with the proposed acquisition; the expected cash flows and minimum volume commitments related to the acquired assets; capital commitments, projected capital contributions and capital and operating expenditures, including the amount and timing of reimbursable capital expenditures, capital budget and sources of funds for capital expenditures; liquidity and financing requirements, including funding sources and availability; dividend and distribution amounts, timing, rates and growth; projected adjusted EBITDA, projected EBITDA, projected EBITDA of the acquired assets, projected leverage, and projected coverage ratio; the effects of government regulation, tariffs and litigation; and tax position. These forward-looking statements involve risks and uncertainties that could cause actual results to differ materially from projected results. Accordingly, investors should not place undue reliance on forward-looking statements as a prediction of actual results. ETRN and EQM have based these forward-looking statements on current expectations and assumptions about future events. While ETRN and EQM consider these expectations and assumptions to be reasonable, they are inherently subject to significant business, economic, competitive, regulatory and other risks and uncertainties, many of which are difficult to predict and are beyond ETRN’s and/or EQM’s control. The risks and uncertainties that may affect the operations, performance, and results of ETRN’s and EQM’s business and forward-looking statements include, but are not limited to, those set forth under Item 1A, “Risk Factors” of ETRN’s Form 10-K for the year-ended December 31, 2018 as filed with the Securities and Exchange Commission (SEC), and Item 1A, “Risk Factors” of EQM’s Form 10-K for the year-ended December 31, 2018 as filed with the SEC, in each case as may be updated by any subsequent Form 10-Qs. Any forward-looking statement speaks only as of the date on which such statement is made, and neither ETRN nor EQM intends to correct or update any forward-looking statement, whether as a result of new information, future events or otherwise.